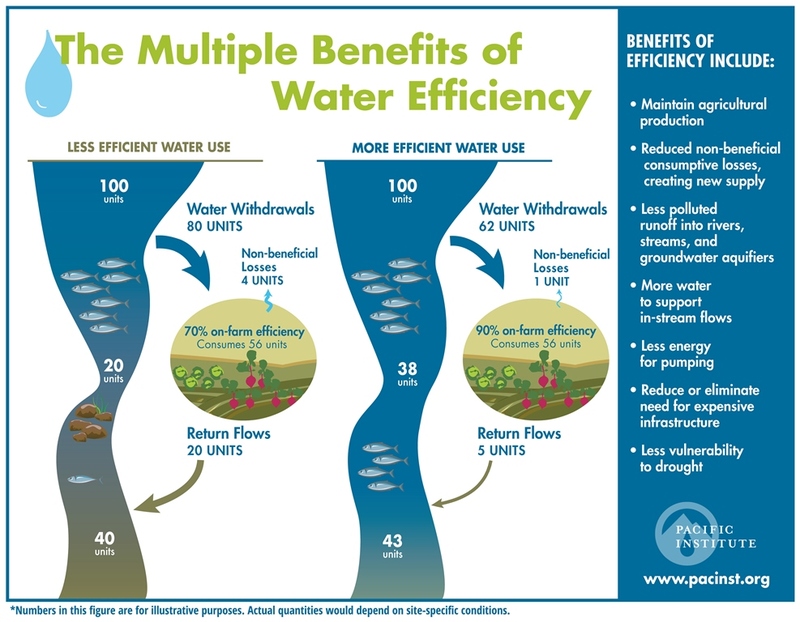 The Institute’s latest fact sheet and infographic, The Multiple Benefits of Water Efficiency for California Agriculture, describes the benefits of water efficiency to farmers, ecosystems, and society. The benefits associated with reducing both consumptive and non-consumptive water uses argue for a comprehensive approach for promoting water-efficiency improvements that allows us to address complex and interrelated water management challenges in California, including water-supply reliability, conflicts among water users, the risks of droughts, worsening water quality, and ecological degradation. Read more. In July, among the topics covered are water regulations, wildfires, and salmon populations. In the latest, California senators and representatives have introduced W21: Water in the 21st Century legislation into both the House and Senate. Read the latest drought update. The New York Times Editorial Board examines the California drought in their op-ed “Saving Water in California” – a piece that discusses extensively and links to the Institute’s recent work on agricultural and urban water conservation and efficiency for water supply solutions. Read more. In an op-ed in the San Francisco Chronicle, Pacific Institute President Peter Gleick explores how the response to the California drought been “weak and largely ineffective” and the imperative for water agencies and users to do more to respond to current – and future — drought conditions. Read more. In a special issue of Scientific American, Peter Gleick writes an engaging introduction to “The Past and Future of California’s Water.” He explores the history of western water and how the surge of modern engineering and infrastructure that built up the West has now left western rivers diverted and consumed. Throughout, he describes how the environment and natural resources have been altered over time and have intensified California’s need for solutions. Read more. On August 6, the Pacific Institute’s Water Program Director Heather Cooley participated in a Twitter chat hosted by Sunset Magazine. The discussion featured panelists from NRDC, SFist, Grist, Save Our Water, and others who tackled questions like, “Are lawns evil?,” and, “What steps should people take to transition to a low water-use garden?” You can read the full chat on Twitter by searching #SunsetChat or by clicking here. Circle of Blue‘s trendsetting reporting on Western water issues in the United States and its scintillating photography of the contest for freshwater in India, California, and the Great Plains were honored in August with two awards from the Society of Environmental Journalists (SEJ), the premier professional trade organization representing 1,400 journalists and academics in 27 countries. Read more. After adding 2 million acres of irrigated farmland over the last two decades, Arkansas is now the third-largest irrigation state. But in growing acres of rice and cotton, farmers have depleted the state’s primary aquifer by one-quarter. Arkansas is an extreme example, but the state embodies a national trend. Irrigation, long the domain of the U.S. West, is spreading eastward into the Midwest and the South. Circle of Blue reports on the benefits and consequences of the irrigation shift and features a new interactive tool to see how your state is irrigating. – Program Director Catalina Garzon is presenting with coalition partners the Oakland Climate Action Coalition and the Ditching Dirty Diesel Collaborative at the inaugural California Adaptation Forum in Sacramento, California on August 18-19. The Forum will engage a diverse mix of more than 600 California policymakers, practitioners, elected officials, public- and private-sector leaders, nonprofits, and researchers addressing public health, energy, water, emergency management, agriculture, biodiversity conservation, and coastal management issues associated with climate change and adaptation. For more information or to register for the Forum please visit http://www.californiaadaptationforum.org. -The Desert Sun: Ian James talks to Peter Gleick about Nestlé’s bottling water in a desert region during drought. -National Geographic: Pacific Institute work is part of this special feature on the state of the Colorado River. -California Magazine: Heather Cooley adds insight to the story on California’s water crisis. -BBC Business Daily Broadcast: Peter Gleick debates the feasibility of trading water as a global commodity.